Once again the charm and grace of Babaji lit up the shivir at Goa. 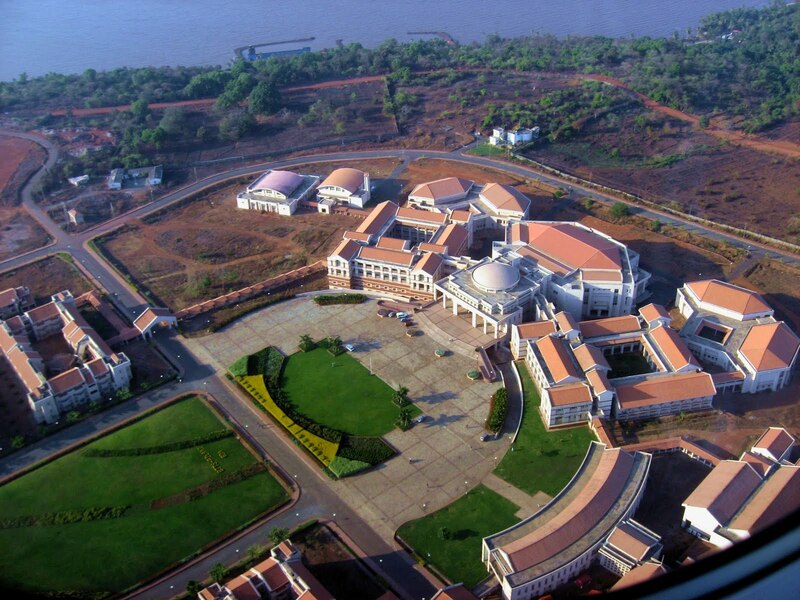 This was the first time a shivir was conducted in Goa. The venue was at BITs which is over 188 acres of land that is well equipped with all amenities situated on the banks of Zuari river. The clean and neat hostels and with the huge mess with good seating capacity made it very convenient for the sadhaks. I must thank the organizers who did a fabulous job by choosing this venue. 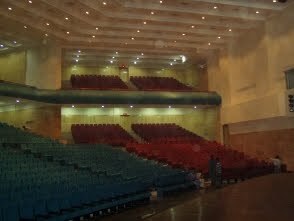 The auditorium was pretty huge and was close to the hostel and mess that made it even more convenient. Shuttle buses were organized for people to shuttle not only from Panjim and Vasco but between also to shuttle between the canteen and auditorium. Though the climate in Goa is pretty hot in May, the breeze from the Zuari river kept the temperature tolerable. Most beautiful were the huge green lawns spread out where we spent most of our evenings meditating, singing, sending healing, chatting, discussing, and having great fun. It was so much like a big big home where a whole lot of family lived together under the grace of the father of the family. I was awed to see so many children this time, aged as little as even 3 years. Babaji almost everyday reminded that children are divine and they should not be hurt or neglected. He constantly gave messages to parents to shower them with unconditional love and never to criticize them. He said that kids are connected to the divine till the age of five after which they slowly start becoming conditioned to human upbringing and the cord from their sahasrar connected to the divine eventually gets cut off. He reminded that they are all coming to earth at this time for a special purpose. Surprisingly, none of the children created any disturbance at any point of time during the entire shivir. They were totally silent and calm even when all were in sadhana for hours in silence. They did not do any meditation but looked all around silently seated in their places. I met and befriended a little angel about 3 years old who often sat out in the hall out of the auditorium during breaks with her grandfather and helper. She carried a beautiful name - Saanvi. She spoke Marathi. She recited the Ganesh Stuthi with such accuracy in tone, rhythm and pronunciation. As she played with the toys in her hand, I sat in front of her and asked her in Marathi why she has come and she replied "shivir". Then I asked her whom she came to meet here. She replied, "Avdhoot Baba!" I asked if she met Babaji since I had seen Babaji blessing kids and she said yes. When I asked what did he say, she replied, "He kept hand on my head and said Bless me!" Yes, 'bless you' was what she was intending to say. She then excitedly told all people who stopped to look at her that Babaji told her "Bless me!" Then I asked if she could give me a little healing and she immediately sat with her hand raised and palms up, her little fingers spread out and closing her eyes tight shut sent me Sanjeevani! Don't know what her intent here was or what did she think with her eyes closed but I am sure love flowed out of her. It is amazing how the kids are. They are born divine. They are truly connected to divinity and so they do not have any difficulty connecting with masters like our Babaji. Everytime Babaji walked onto the stage, he walked through the first door of the hall entrance and little kids gathered up there just to catch his attention. They did everything they could to catch his attention while he walked in and out of the hall. Most of the time Babaji stopped to look at them and placed his hands over their heads to bless them. Some children lifted up their Golden Books high enough for Babaji to see and Babaji acknowledged them back with raised eyebrow smiles. Baba said that we must all know why we have come on earth, to find out what is our soul purpose and manifest it through the Golden Book. Babaji also shared that when he asked himself years back what was his purpose of life, he got the answer that it was to give unconditional love and since then Babaji has been doing the same. Babaji strongly recommended doing the Nachiketa Agni Dhyan to heal the past and clear negative psychic impressions. He also reminded that a sadhak has to do sadhana importantly and not to sit back thinking everything will happen on its own. He said that sadhaks now have the grace of Sanjeevani that will help the sadhak to manifest all their positive desires and burn negativities provided one does regular sadhana. Babaji stressed more on doing advait sadhana (nonduality) than dvait upasana (duality) and on and often repeated that ShivYog is based on advait sadhana (nonduality). He spoke extensively about ascended masters and spiritual invisible guides who are always with us. 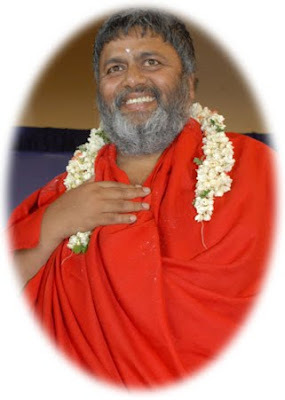 By doing more sadhana one raises their vibrations and ascends to higher level and as one ascends even the spiritual guides who have been assisting us also ascend. Once they ascend, they leave us showering us with gratitude and blessings and proceed with their journey and new guides on that level come to assist us. So, he said it is important that we acknowledge them and thank them for their divine guidance and support. He said that one can get rid of all problems and avoid creating further problems by forgiveness and by being nonjudgemental at all times. The last day of Shambhavi was a special one because Babaji declared that we will all be doing the MritSanjeevani with the evening sun and that too out in the lawns below the guestroom where Babaji stayed. It was an awesome experience. This place was almost a kilometer from the auditorium but well within the campus. The sevaks put up all the sound system and hosted a pendal for Babaji and we all sat on the slopy hilly lawn facing the evening sun while Babaji sat just behind us and taught us the sadhana. It was just wonderful to be able to do this directly facing the sun, in nature with grass and trees around with birds chirping and cool breeze blowing across our faces. It was a great experience with Babaji sitting so close to us and even more pleasant to see Babaji explaining things to us as his hair and beard blew across his radiant face. On the first day of Sri Vidya Babaji gave a great experience of kundalini awakening and inspite of the visible experiences some sadhaks had, he said it was mild. I was imagining if this was mild, what would be anything more than this. Babaji again said, "It is Guruma's wish that I go slow with process to make things easier for sadhaks." Babaji and all laughed as he continued, "She says that I should behave in public." Babaji kept assuring all that there is nothing to fear and he is with everyone. As he did the shaktipat all had different experiences and many were in state of peace and tuirya avasta, which many described later as "falling asleep". The first two days of Sri Vidya was too pleasant and blissful. In one session he took us into deep trance and kept us floating there for about 3 hours! When we "came back" from that state it was a disbelief when Babaji said it is 7 p.m. This shivir was also special because of the presence of Anuradha Paudwalji who had come to attend the shivir. Babaji one day humbly requested that he would like her to sing for us which she did. She sat right in front of babaji on the stage and humbly offered all her songs to Babaji and thanked Babaji for the calling that she had with Babaji's voice after she attended Prati Prasav with Ishanji. Babaji said that he is "reading" messages from sadhaks that they want more and requested her to sing the next day also. 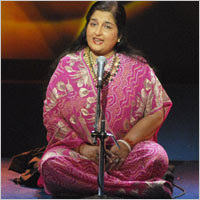 Her songs were just brilliant and it radiated so much of vibrations as all along with Babaji joined singing with her. As she ended, Babaji gracefully thanked her and said that he too had enjoyed listening to her bhajans long back when they were recorded and sold as cassettes. Babaji's musicians were excellent as they played all her songs in perfect synchronicity. They were also sharing their skills back in the hostel, playing instruments and singing in the evenings, as they stayed in the same place. Our special gratitude for them. Next time, I shall put up more on these little-known people who work so much for Babaji and us to create such a great ambiance in the shivirs. Finally, on the last day of shivir Babaji gifted all little ones with battery-operated toys. He operated one car and it's lights began blinking and as the car toy began playing a hit song and Babaji moved and shook in excitement like a small child with his eyes wide open. He asked that the car be run on the stage. As he continued talking with us, the car continued doing it's rounds on the stage with the hit hindi song. Then asked each child to be given the toys. Treating children with utmost love and care and at the same time being disciplined but not harsh. He also conveyed that he wishes to teach more of yogic science to people. He said he is wishing to teach people to live on only Sanjeevani for which he needs genuinely interested sadhaks to spend at least one month with the program. He also wishes to install Pardeshwar Linga free of cost to temples which can be built by anyone according to his strict guidelines. He said the Pardeshwar Linga is the purified form of paras (mercury) and it takes around 6 months to make this Linga and purify it. It then becomes so pure that it becomes the divine part of Shiva and not only the people who meditate around it benefit, but also the entire area where it is installed. He added that he is willing to teach people how to make this Pardeshwar Linga also and that everyone must learn this science which is becoming extinct, but added that it needs dedication to learn it as it would take as good as 6 months to be with the process. Babaji also revealed that the previous night he was making Bhasm amrit which he said after purification if given to anyone can heal all ailments and sufferings. At 2 a.m. early morning he had given it to one sadhak who came from Pune after Babaji called him to come immediately due to some worsening physical ailment. The sadhak next day spoke in the Shivir to all that he was cured after taking it. He mentioned that he is willing to teach to make this amrit in the future to all who were interested. Purification is very important through sadhana that will enable a sadhak to raise one's vibration so that he/she can match with the 4D vibrations that this 3D earth is moving towards. Those who remain back in the 3D will continue to suffer. One will need to depend more on prana (life-force energy) than physical foods. It will be like two worlds existing at the same time. One should get more connected to nature and animals. Grow more of plants and live where there is nature around. Get more connected and live where there are all tatvas together - earth, fire, water, air, ether. Live on the ground floor where one can be connected with the earth. Depend more on solar power than electricity; start installing solar equipments. Grow your own vegetables according to one's needs to avoid the heavy contamination in foods. Instead of getting crowded in cities, try to live 10-15 kms away from cities. Thank you Babaji for your divine guidance, blessings and support to humanity and all living beings! Thanks for information, as feels like I myself have attended the shivir. Wonderfully portrayed..thank you. I have never attended any shivir but wish to clarify one thing..the delhi ashram informed me kids were not allowed in any shivir. I have 2 little ones and reading your post here suggests that might not be true. You are right. Children are not allowed but you may have to take special permission from the organizers for that. Please check this out with the ashram if in case you like to take children along. Namah Shivaya..
Namah Shivay Jacob Bhai! Thank you so much for sharing your shivir experience. After reading, it really feels as if I have attended the shivir. Bless you. Shilpa... Nothing much to worry.. with more of sadhana and cleansing our lives will be like an ongoing shivir :) Inshallah! Namah Shivaya Jacob Ji! Babaji ki jai ho! My husband and I were a part of the Goa Shivir and since the time it was over and we were back home life was never the same. We feel as if reborn again and cant get the Shivir experience out of our minds and hearts! The magnetism that Babaji spreads is simply so mesmerizing...we were longing for the experience again and again ...and this article of yours has helped us navigate through our memory lanes and made us relive the shivir again! Thank you so much for giving us such nice memory back. Om Namah Shivaya! Namah Shivaya Jyotiji... The shivir world is a different world full of vibrations and positivity. The seed is planted by Babaji is all in the shivir so that they can go out and start creating more of such worlds in their own places. Namah Shivaya! You are doing a wonderful sewa by sharing your experiences and inspiring others . my name is chetan. i have also attended the goa shivir. i came from singapore to attend the shambavi and sri vidya course...i would love to share my experience with you.i have attended teh mumbai shivir also in jan 2010.kindly email me your phone number at chetan787@gmail.com. i would love to talk to u..
Namah Shivaya Kumud and Chetan..
Chetan, glad to know that we were there both in Mumbai and Goa... but still didn't meet :) Will mail you. Namah Shivaya! You are doing a wonderful job by writing articles, this was amazing, I really felt like I have attended the shivir at goa. namah shivay!your article is very inspiring & energetic.i am from Goa and by luck i attended six days of shivir.i dont have words to express my feelings towards babajis grace.and also i cant measure it as we cant count the waves of sea.Everythiong is marvalous.thanks ,very much thanks to Babaji.And i am looking forward to attend the shivir to banglore. You can accomplish 30 times more items than what you are right in. Even when you reach th 29th step still you have 30 times more power balance. Hence the most powerful YOU ARE. Namah Shivaya Jacob & all……..
Everyone from family attained Babaji’s various Shivirs, other than me, hope to attain it someday. My mother attending the ongoing Shivir at GOA.